Too Many Chickens! » Blog Archive » Happy Fourth Of July! In honor of the holiday, no post this week. Everyone’s outside having cookouts and not listening to me anyway. See you next week! Some people (and chickens) are sensitive to loud noises. 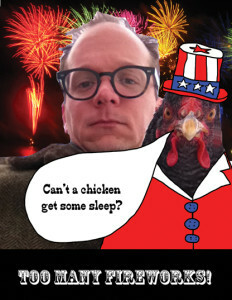 This entry was posted on Saturday, July 4th, 2015 at 8:04 am	and is filed under Chickens. You can follow any responses to this entry through the RSS 2.0 feed. You can leave a response, or trackback from your own site.